Looking NE at SE corner of cottage. A very nice morning, which brought us lots of curious visitors out for a walk. 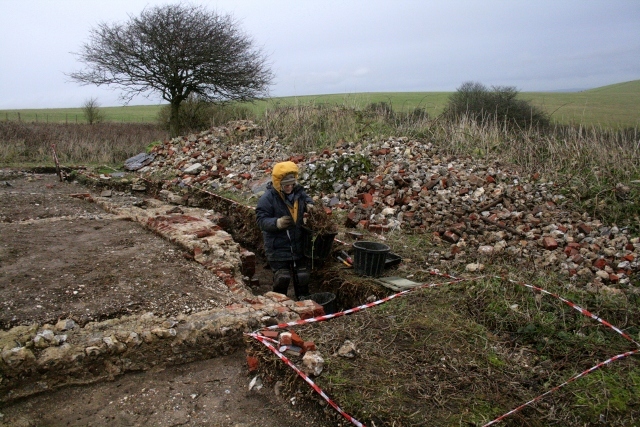 Survey work continues, as well as further digging to the east of the cottage, south of the projecting chimney base. Because most of that excavated was demolition fill, finds were few and unexceptional. The day ended shortly after lunch when rain returned. Preparations for our talk, Friday 10th January at the Woodingdean Holy Cross Church Hall, at 7-30pm, are getting a little frantic so we will probably not be back on site till Sunday. The idea of the talk is to use twelve historical objects and key dig finds to illustrate the story of what we have discovered of the origins of Newmarket Farm, and the lives of those who lived there. See you there?